So by now Chris Brown either needs to go to prison for a few years or he seriously needs to change his inner circle of people that he is around. 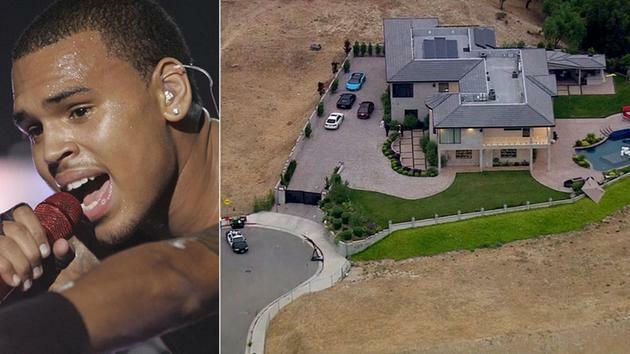 Police in Tarzana, California are trying to obtain a warrant to search Chris Brown’shome after a woman called 911 claiming he pulled a gun on her. TMZ reports that the singer had guests in his home, including Ray J, when 3 uninvited people were let inside by someone. Chris Brown will be back in a court room again over something new. He is CLEARLY an example of an entertainer who doesn’t know when he has an easy life OR some who NEEDS to change who his inner circle of friends is–WHY- because he keeps having weird run ins with the law that would get the average person KILLED or some serious time in prison. In his latest incident..Brown has several guest at his Tarzana, California home including Ray J of Kim Kardashian fame and somehow 3 to 4 other people who were not invited got in. Apparently at some point Brown wanted the uninvited people to leave and this is where things get crazy. A woman claiming to be a victim told police that Chris Brown pulled a gun on her and other and made them leave his home. When Ray J left the home he was handcuffed by police. After detaining him briefly he was let go, but his car was kept as evidence. Meanwhile, Brown has posted several Instagram videos saying he’s done nothing wrong and was asleep at the time of the alleged incident. This story is developing…stay tuned for more. This entry was posted in Featured, Hip Hop, Music News, The 4 Corners Of The World and tagged Chris Brown, Chris Brown attacks woman, Chris Brown pulls a gun, Hip hop music, LAPD search Chris Brown house, R&B singer Chris Brown, Woman claim singer pulled a gun. Bookmark the permalink.